PLEASE NOTE: Now that Microsoft has released their officially supported fix I am no longer providing the download for the recovery drive. If you wish to keep a small recovery drive then repair your system using the instructions from Microsoft, then follow “Option 1” to create a new small boot drive. It uses the same steps to complete the upgrade with the last part being to recreate the full recovery volume. Some news sites are saying the MS image will revert you to 8.0, it does not. It will complete the 8.1 upgrade and then the extra steps are to recreate the on-device recovery volume with the 8.0 image which only applies if you rollback sometime in the future. COMMENT: I’ve also received confirmation that my approach works on a Japanese and other non-English language WindowsRT devices, which is good news as that’s not a test I could have done, and hadn’t even considered tbh. Also, While I refer to “Surface” because that’s what I have. 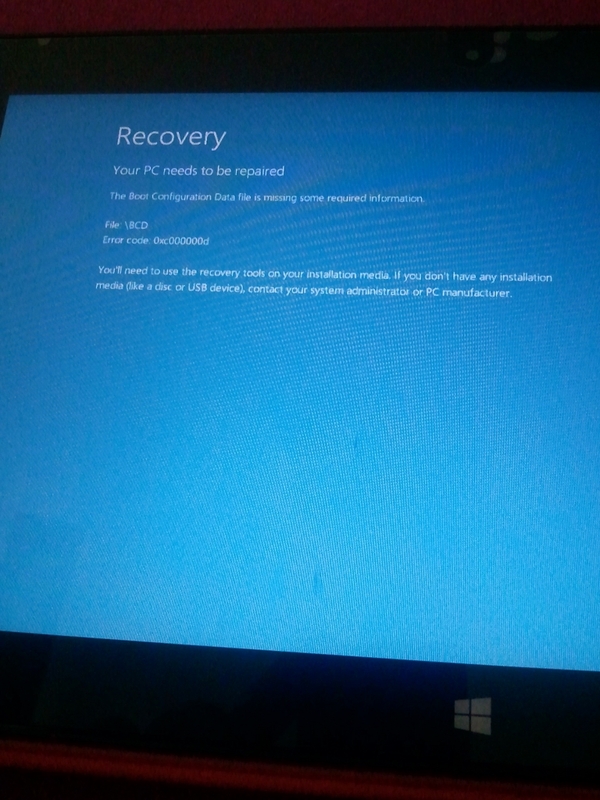 these steps will also apply to any WindowsRT tablet device. So something has gone horribly, horribly wrong. You do of course have the USB key you created shortly after setting up your Surface, don’t you? First point – How annoying is it that you can only update Windows RT from the App Store, although probably not a drama if you only have one tablet. Slightly annoying if you have two. Both need to download the update, so that’s 2x the several GB needed. If you happen to be an enterprise/business that decided to buy several of them (does such a entity exist?) then it would appear you are about to have a ton of downloads happening unless you boost your proxy cache size. And now for todays story. I updated one Surface RT with no drama. It took a long time but I just let it run overnight and it was all good the next morning. The other tablet, not so good. So here’s one that had me stumped. I can’t get ActiveSync connections working for some users on some devices. I’ve found a lot of posts around the internet talking about it being an issue related to self-signed SSL certificates, but I don’t think that is what my problem is. A fair collection of devices to compare the issue across. So what does/used to work? There’s an issue that seems to have been I introduced after the last round of updates, either a driver or firmware update. Basically what happens is the connection drops into “limited” mode and you lose connectivity. People have reported various methods to reconnect, I find just disconnecting and reconnecting the connection worked fine… for another 20-30 minutes at least. My access point has 2.4 and 5ghz so I just switch between them when it happens. Still a huge pain though. There are a few registry related hacks that have been suggested, but I’m going to wait and see if an official fix comes soon. This didn’t really cause me any concern, but I thought it was very odd for a modern computing device to exhibit this. Considering all the shielding and insulation usually required of modern electronics it was rather unexpected. Something I noticed a long time ago while laying in bed with the electric blanket turned on was that you could feel this small tingle when touching another person. While I haven’t exhaustively researched this phenomena my belief is that the electric blanket is generating a small electromagnetic field which is then inducing a simliar field in a person lying on the blanket. When lightly touching another person (using the back of your fingers is most obvious) you feel a small tingle like an extremely mild electric current. I’ve played with electronics a lot as a kid so I knew it wasn’t a “bad” thing. I have not felt a simliar thing from a piece of computer equipment though except for when working with computers that had bad power supplies that didn’t have proper grounding. My daughter dropped her brand new Surface tablet from a height of about 2 feet (from her lap while sitting). Somehow it managed to land in an orientation that wasn’t one of the 72 tested by Microsoft and managed to smash the glass in one corner of the screen. This happened about 3 hours after it was opened on Christmas day and was disappointing for several reasons, one of which was the significant points that had been made about how strong the tablet was supposed to be. Anyway, long story short, we had several other issues with touch covers splitting and Microsoft agreed to exchange the tablet at no charge. Greatly appreciated. It still took about 2 weeks to go through the process of organising the exchange. The tablet was still useable, however two weeks means there was now content that needed to be backed up and transferred to the new device. There were three different users profiles and various photos and documents that we wanted to save.